The Cape Fear and Deep River Navigation Company aimed to provide improved water access to the naval stores of the Upper Cape Fear Valley and to the coal deposits of Moore and Chatham Counties. Originally, the Cape Fear Navigation Company sought to enhance the navigability of the Cape Fear River above Fayetteville-including the Deep and Haw Rivers-but after receiving little benefit from its expenditures, it abandoned the Upper Cape Fear by 1830 to concentrate on the river between Fayetteville and Wilmington. In the 1840s residents of Moore and Chatham Counties attempted once again to open the Upper Cape Fear and Deep Rivers to navigation; Wilmington, which hoped to benefit from increased river trade, supported the effort. A meeting in Pittsboro in August 1848 authorized a survey of the watercourses and appointed a committee to petition the legislature for a charter of incorporation. The General Assembly complied in 1849, promising state financial assistance. Work on improvements began in 1850 but progressed haltingly due to winter freshets that destroyed locks and dams, a labor shortage that resulted from the unsuccessful utilization of immigrants, and, despite state aid, insufficient funds. In 1855 company officials persuaded the legislature, still enthusiastic about the prospects of tapping coal deposits in Chatham County, to permit them to issue $300,000 in bonds with the state acting as security. Following the 1855 legislation, the little-changed "New Company" continued to suffer not just from labor shortages and unsatisfactory engineers but from fundamental problems such as improperly designed and decaying locks and dams, internal dissension, and mismanaged funds-raising arguments from the editor of the Fayetteville Observer concerning the greater utility of railroads compared to river navigation. To protect the public interest in the face of the company's looming bankruptcy, the legislature authorized the 23 Apr. 1859 purchase of the company for $365,000. The Board of Managers of the newly renamed Cape Fear and Deep River Navigation Works hired the capable and conscientious Elwood Morris as chief engineer. He and his crew finished the improvements on the Cape Fear by April 1860 and those on Deep River six months later, finally completing the project after a decade of turmoil. Before Morris could leave, though, a series of freshets in November seriously damaged the works. In February 1861 an exasperated legislature restricted expenditures on behalf of the company to $30,000 annually and sought to sell the works. Rather than pursue repairs, the governor directed Morris to suspend operations. In 1873 the state sold to the Deep River Navigation Company the navigation works from Foxes Island in the Cape Fear River to the junction of the Deep and Haw and up both of those rivers. Wade H. Hadley Jr., The Story of the Cape Fear and Deep River Navigation Company, 1849-1873 (1980). Elsie Faye Russ, "The Cape Fear and Deep River Navigation Company, 1849-1873" (M.A. thesis, Wake Forest University, 1970). 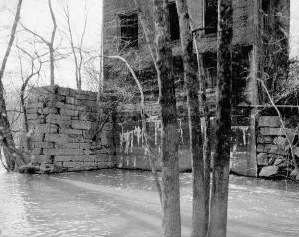 "View showing east elevation of powerhouse and masonry retaining walls- Lockville Hydroelectric Plant, Deep River, 3.5 miles upstream from Haw River, Moncure, Chatham County, NC." Image courtesy of Library of Congress, call #: HAER NC,19-MONC,1--16. Available from http://www.loc.gov/pictures/collection/hh/item/nc0408.photos.101705p/ (accessed July 6, 2012). 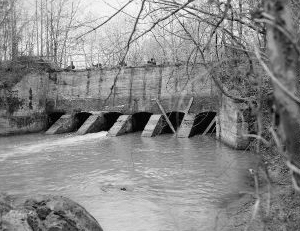 "View looking west at Sluice Gates at dam from north bank of Deep River- Lockville Hydroelectric Plant, Deep River, 3.5 miles upstream from Haw River, Moncure, Chatham County, NC." Image courtesy of Library of Congress; call #: HAER NC,19-MONC,1--6. Available from http://www.loc.gov/pictures/resource/hhh.nc0408.photos.101695p/?co=hh (accessed July 6, 2012). 1 January 2006 | Watson, Alan D.
Where can I find a navigation map of the NE Cape Fear River from Wilmington to the NC53 hi-way bridge in Burgaw? The N.C. Wildlife Resources Commission may also be able to provide assistance. Here is the link to their Boating Resources page http://www.ncwildlife.org/Boating.aspx. You will also be able to locate contact information here. These agencies may be able to direct you to resources if they can't provide exactly what you're looking for. Please feel free to post back here if you need additional help or these aren't the types of resources you're looking for.